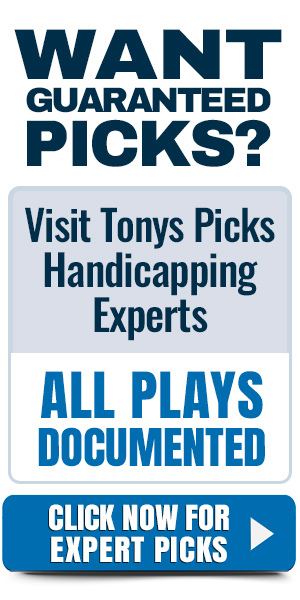 Tonys handicapping videos are updated with 4-8 new episodes by 7AM ET every day. When you Click Play the video will begin. When each video is finished the next one automatically begins. Click the Playlist link to display all of the videos. 4-8 videos daily. Sports picks handicapping videos are produced every day by Tony T as between four and eight games are broken down from a point spread angle. Covered from a sports betting perspective are NFL picks, college football picks, NBA picks, college basketball picks as well as MLB picks. Get the opening lines and early line movement from all of the biggest games on the card today. These sports betting handicapping videos are packed with information aiding the bettor in their decision making process. Tony T takes a professional information fact finding approach and avoids the ill attempt by competitors to entertain their viewers with comedy and nonsense. His style appeals to mature minded individuals who take their craft seriously. Your time is valued and we will reserve our sports betting video handicapping tips to just the facts pertinent from a betting perspective. Visit our page daily as we provided fresh content with 4-8 sports handicapping videos uploaded daily by 7AM Eastern Time.